Fall is here and the nesting season is about to begin. Unlike spring cleaning, fall cleaning is not about airing out your home, organizing closets or giving your floors a proper scrubbing. This time of year involves making space in the kitchen for heartier cooking action and feeling more comfortable during the hibernation months. Cleaning out your pantry and at the beginning of each season is never a bad idea. We aren't saying you should throw everything away, but it's smart to reorganize and take inventory of what you have. If you love to cook and or indulge in treats, Halloween and Thanksgiving are probably your favorite holidays! If that's the case, you may have even thought about your menu plans already. Truth is, whether it’s your first-time hosting a costume party or you’re a seasoned pro at prepping a Thanksgiving feast, maneuvering around the kitchen during these times can definitely be stressful. We're here for you, though. 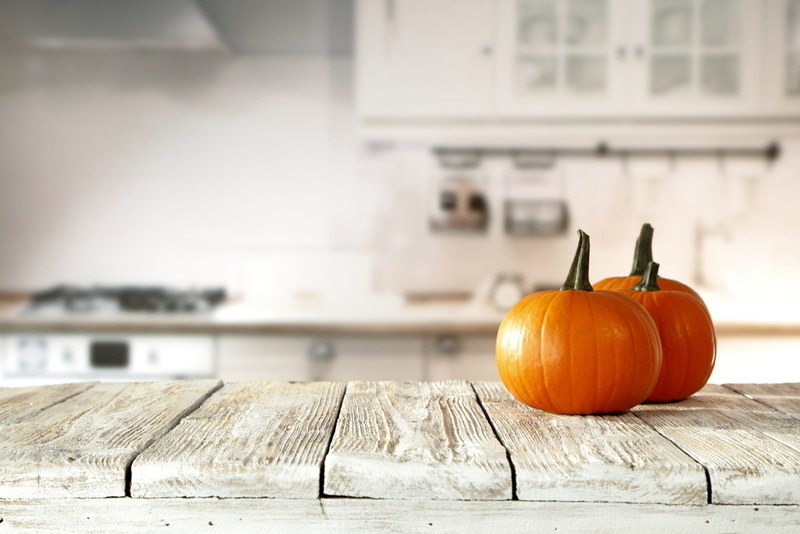 Fall forward using these tips to prep your kitchen. A freshened up refrigerator can be a game changer during this time of year. Not only can you find ingredients with ease, but you're likely to have more room for platters and large dishes when it's party time. We're talking about slow cookers, casserole dishes and the good ol' oven. Place these items in accessible areas of your kitchen and give that oven a deep clean. Nobody wants their pies cooked in a grimy situation! This one might seem weird, but switching your soap to a fall scent can change your mood instantly! Plus, despite the refreshing changes this season brings about, it also comes with lots of sneezing, sniffling, and coughing. So, if you don't already have a strong anti-bacterial soap, this would be a good time to swap. Even though your grandma's stuffing recipe might be one of your favorite dishes of all time, testing out new appetizers and desserts can make a huge impact at your event. At this time of year, you’ll also want to consider stocking up on the proper supplies. There is a lot of baking to be done and you need to be sure that you're equipped! Dump those expired ingredients and trade real cobwebs for fake ones. Nothing quite brings in the spirit of fall like colors such as golden yellow, orange and various shades of red. A few wood accents here and there will turn your space into a charming fall oasis, too! Even with your best efforts to keep your house warm, you may still notice that the floors in your kitchen are cold during the fall and winter. No one likes stepping on a chilly floor the morning after a festive shindig. Laying area rugs can help you avoid this and make your dining area cozier as well! Is your kitchen ready for the upcoming season? We’d love to hear about the ways you fall-proof your space in the comment sections below.